11 July 2018: The Open Geospatial Consortium (OGC) has released a Call for Participation to solicit proposals for the OGC Vector Tiles Pilot Initiative. The Vector Tiles Pilot, sponsored by the US Army Geospatial Center and the UK Defence Science and Technology Laboratory (Dstl) will advance an OGC approach to encode and publish Vector Tiles, and will propose extensions for WFS, WMTS, and GeoPackage. Vector Tiles are an emerging technology that packages geographic data into predefined roughly-square shaped ‘tiles’ for efficient transfer over the web. Vector Tiles provide various opportunities, including: faster loading of web maps; flexible styling with modern, easy-to-use tools; and an incentive for commercial innovation while simplifying interoperability for command and control, consumer mapping, and many other applications. OGC has coordinated several initiatives to advance the use of Vector Tiles. Testbed 12 and Testbed 13 advanced ideas, found issues, and proposed change requests to existing standards. However, this pilot is looking to advance extensions for current OGC standards. 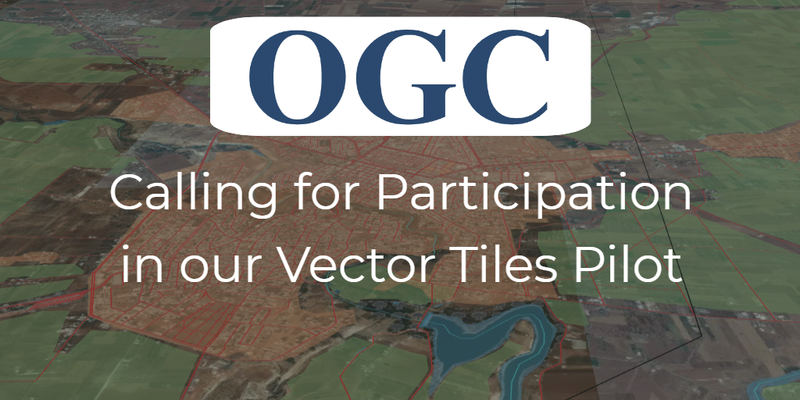 More information on the Pilot, including the Call for Participation, is available on the OGC Vector Tiles Pilot Initiative Webpage. Responses are due by August 6, 2018. Participation is open only to OGC Members. However, proposals from non-members will be considered provided that a completed application for OGC membership (or a letter of intent to become a member) is submitted prior to (or with) the proposal. This Initiative is being conducted under the OGC Innovation Program. The OGC Innovation Program provides a collaborative agile process for solving geospatial challenges. Organizations (sponsors and technology implementers) come together to solve problems, produce prototypes, develop demonstrations, provide best practices, and advance the future of standards. Since 1999 more than 100 initiatives have been taking place from in-kind interoperability experiments run by a working group to multi-million dollar testbeds with hundreds of participants. Innovation Program initiatives include testbeds, interoperability experiments, pilots, concept development studies, hackathons and plugfests. The OGC also maintains a list of candidate ideas for future initiatives. The Army Geospatial Center (AGC) is a direct reporting element of the U.S. Army Corps of Engineers (USACE), collocated with ERDC’s Geospatial Research Lab (GRL) at the Humphreys Engineer Center in Alexandria, Virginia. The mission of the AGC is to provide timely, accurate, and relevant geospatial information, capabilities, and domain expertise for Army Geospatial Enterprise (AGE) implementation in support of unified land operations. AGC’s efforts encompass the design, development, fielding, and home station support of terrain, hydrological, navigational, imagery, command & control systems, and Geospatial/GEOINT expertise.